Do you play the ponies? This horse racing themed tee bag goes nicely with our Beautify Your Game™ and horse racing series of golf ball markers by Helen H. Thomas. Did you know that July 15 is National I Love Horses Day? 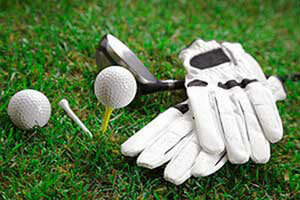 Don't forget your horse themed golf tee bag when you hit the golf course on July 15. 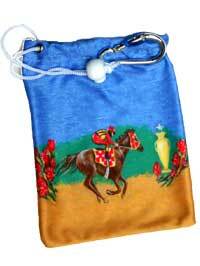 Get our Horse Racing Themed tee bag to store all those golf tees scattered around your golf bag. Drawstring closure with a lock. Hook to easily attach to your golf bag. Comes with nine matching tees. Our themed golf tee bags are shipped from the U.S.A. and are available for shipment to Canada and the Contiguous U.S.A. via US Postal. Approximately 3 working days to process the order plus shipping time.